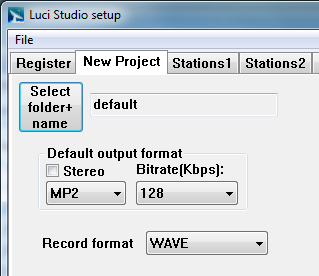 Enables you to select the default folder and name of a new project that is used for recording. This is where you set the default format when you define a new Station. Tick this to broadcast in Stereo. MP2: 48 to 256 kbps. AAC-HEv2 stereo: 16 to 56 kbps. AAC-HE oversampled SBR stereo: 96 to 256 kbps. Wave – the recording will be done in uncompressed wave-format. This is useful if you want to use the recording in LUCI Studio again.